The Oregon coast was hit hard over the last couple weeks by record rainfall and strong winds, causing temporary isolation of many communities in Tillamook County due to road closures. Cape Meares was one of them. Bayocean Road, the only way in and out of the community, was flooded in some locations, covered with debris from several landslides, and undermined by a culvert failure. Residents were locked in for short periods on a couple occassions. Charles Ansorge, President of the Cape Meares Community Association, wrote a report and posted photos at their website, and provided additional information in this post. Cape Meares Loop Road had been an alternative route to the south, through Oceanside, Happy Camp, and Netarts, but it was closed by landslides north of the road to the lighthouse in 2013. When a failed culvert blocked the Loop Road between Oceanside and Happy Camp, Tillamook County provided 24 hour pilot service through the landslide-buckled sections for three days so that Oceanside residents had a way in and out. By then Bayocean Road had been cleared. 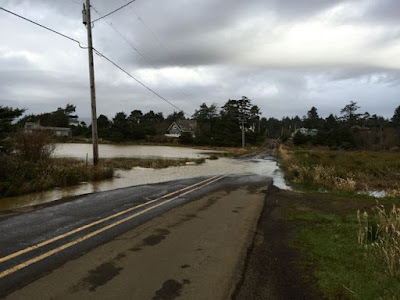 In her December 16, 2015 Cape Meares Fencepost, long time resident Barbara Bennett recalls how grateful she and her neighbors were when the Cape Meares Loop Road was completed, because they then had a way out when Bayocean Road was closed by landslides. This would occur regularly and last for days at a time. Oceanside residents were equally pleased to have another way out when the loop closed south of them. Efforts have been made to acquire state and/or federal funding to repair it, so far without success. looking west, with Tillamook Bay on the right. The original construction of Bayocean Road was difficult. Some sections had to be cut out of the hillside. 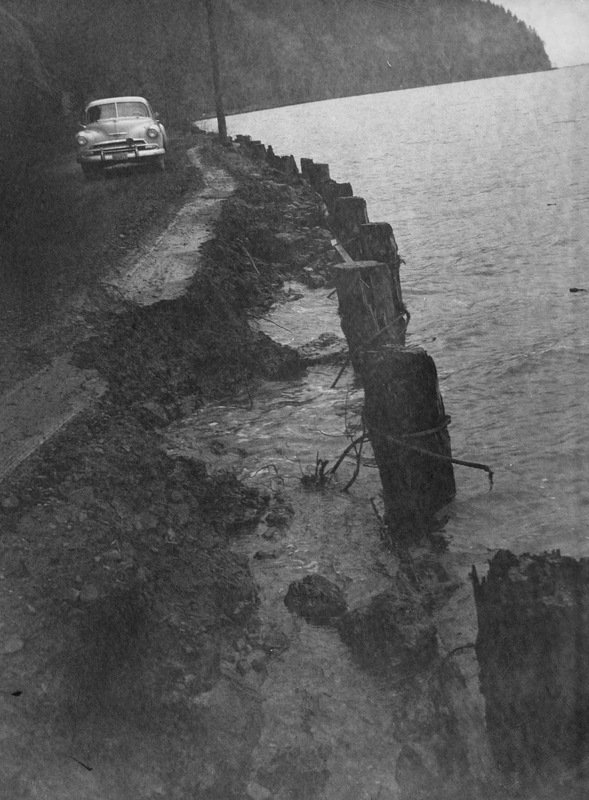 In other places pilings had to be driven into Tillamook Bay and land backfilled behind them. This is one reason it took nearly 20 years for a county road to reach Bayocean Park. Then the challenge became keeping it open. When storms hit, flooding from the bay, and slides from the rain-soaked hillside, slam Bayocean Road from both sides. Bayocean alumni like Perry Reeder tell stories of extended periods when heavy equipment, like tractors and bulldozers, were used to pull cars through the mess. On December 28, 1931 the Oregonian reported a slide dumping 30,000 cubic yards at Biggs (now Pincher) Point, bringing the point home with: "A steam shovel was buried by the avalanche." They hoped to open the road (evidently with a spare steam shovel) in four days. Recent high winds have also blown the top off the Bayocean interpretive sign. It's historic in its own right, so hopefully it can be repaired soon. It's a good idea to check Tillamook County Road Status before traveling during the winter to Bayocean Spit or any of the communities around Cape Meares. You can also sign up for road closure notices, weather advisories, and other emergency announcements about Tillamook County at Nixle.